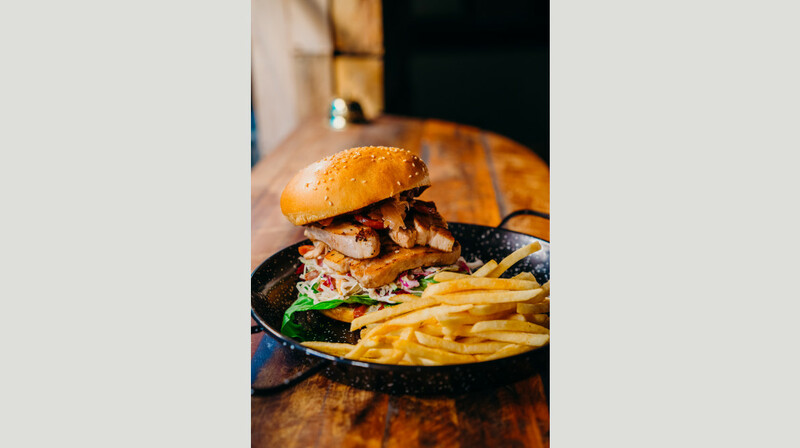 Having just opened its doors, Fifty Gorillas Grill has already stormed the Dunedin dining scene with its cool vibes, awesome service and tasty Western cuisine. 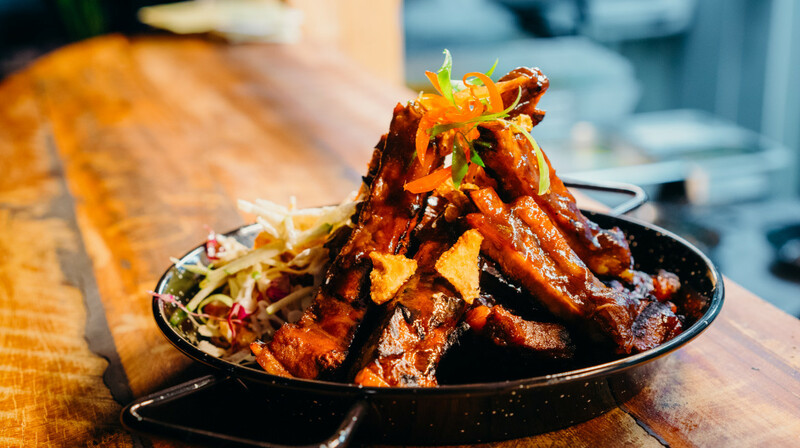 From buttermilk fried chicken and sticky ribs, to juicy gourmet burgers with all the trimmings, you’ll love the range of modern American dishes on this menu! 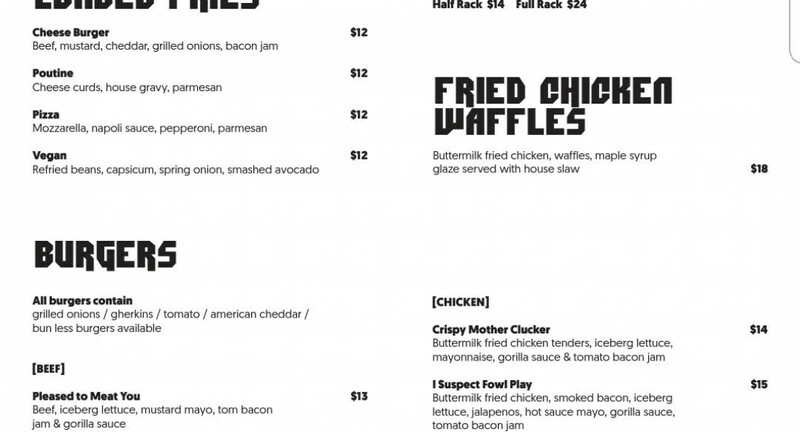 Enjoy fried chicken waffles with maple syrup, or dig into their vegan loaded fries with avocado and refried beans. 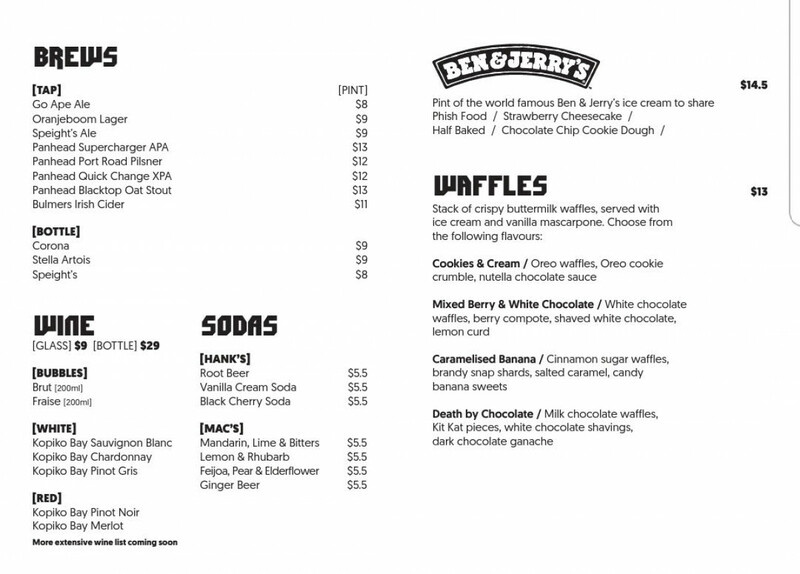 Go for a bunless burgers for a healthier dish, or treat yourself to a decadent dessert (try the ‘Death by Chocolate’ buttermilk waffle and thank us later!). 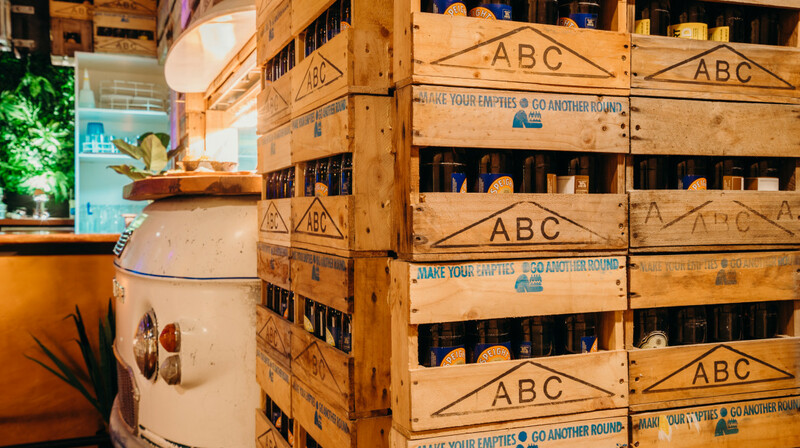 Fifty Gorillas Grill is proud to offer a hand-picked range of local brews and Kopiko Bay wines, as well as a selection of soft drinks from your childhood dreams, like the vanilla cream soda and Hank’s root beer. 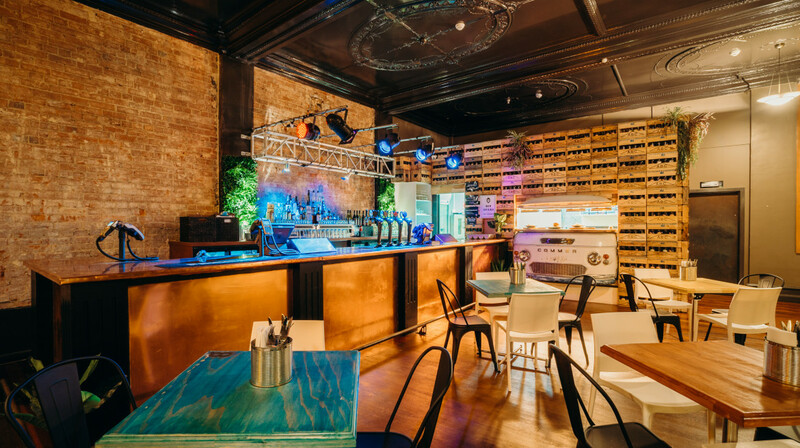 With fun recipes, fresh ingredients and friendly service, this vibrant restaurant ticks all the boxes for a fantastic evening out. Be sure to grab their early bird table fast! lovely wait staff. Got to try chicken and waffles which I have wanted to try for a while. Only place I have found in Dunedin that does! The food was good and there was plenty of it. Definitely value for money. Would go there again. Nice way to spend a Wednesday! We got two burgers (one veggie one chicken) and split the ribs. The food was nice, the service was lovely. Nice time! The staff were absolutely amazing and the food was great. All around it was a great experience and I will go back. Really good food, we all enjoyed our meals that were good value for money. Only disappointment is not living in Dunedin so we could go back more often! Generous portion sizes, especially the loaded fries! Service and food was amazing, prices easy reflect what you get and you definitely don't leave hungry! Service was amazing, was presented with an amazing menu with a lot of variety. Would recommend either just having starters or a main as the plates are huge! Great food, highly recommend the Parma chicken, huge serving you may need a friend to help you finish this one. Burgers were great too. 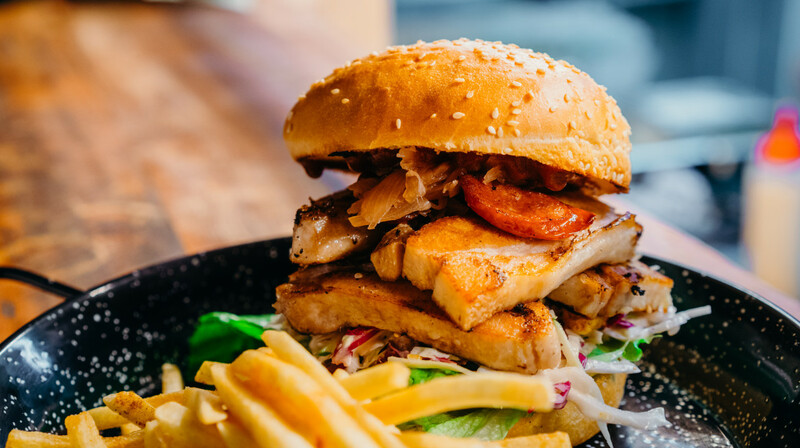 Food is very burger and fries. Could do with lighter option and smaller portions. Fantastic service and great food. Well worth the money. Good food and really filling! Would definitely go back. Great food and service. Meals were HUGE. Great food, great service, great atmosphere. Will definitely be back. 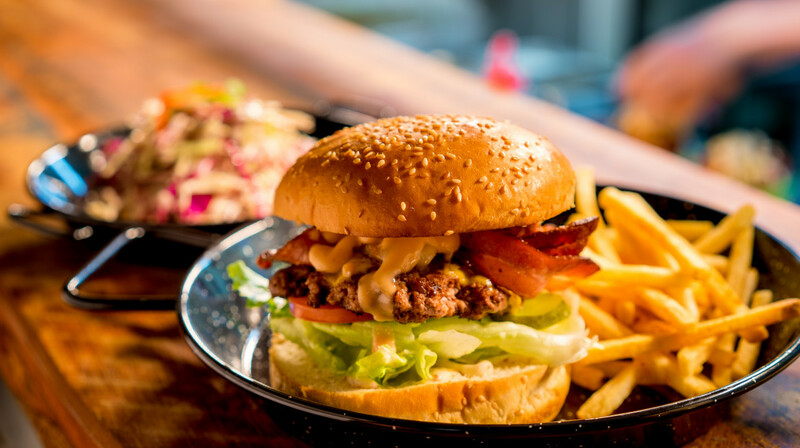 Great burgers, good advice from the staff about burger size. Steak was the biggest steak I have seen, my husband couldn't finish it. Waffles a bit average, think they should stick to the burgers and sides, they were great. We had the meat platter between 2 which was nice. The kids meals were a good size and were brought out really fast which was fantastic. We had a great time. The waitresses were very accommodating and understanding of dietary requirements and understanding of our noisy toddler! Great food and very friendly, fast service. Will be going back for sure. Very friendly staff and good food. I have to say that the portion size is huge, we were so full after having the main that won't be able to try the desert. 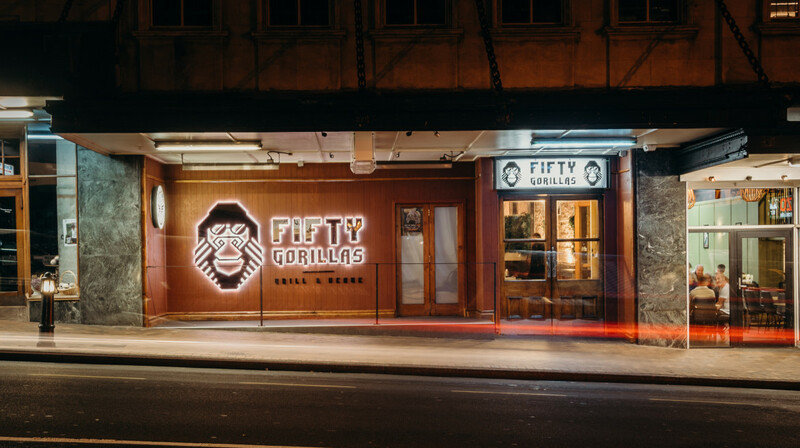 50 Gorillas is a hidden pleasure of Dunedin. Highly recommended. Excellent service and huge comfort food meals. Some of the spices were different but worth a try. 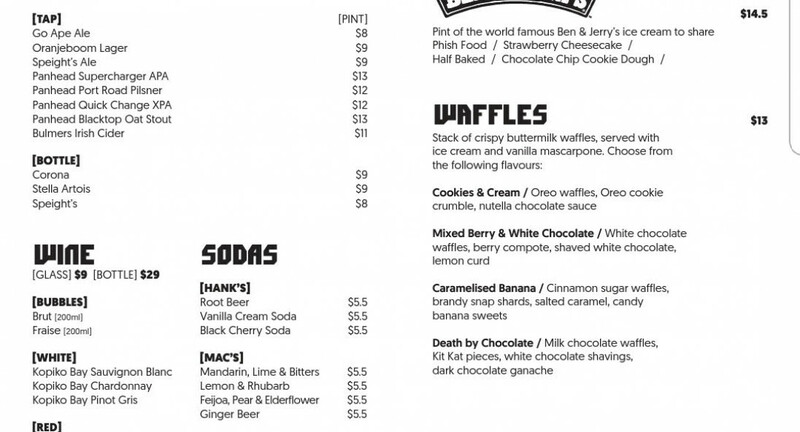 The waffles are to die for!! First time dining here. Three of us dined, each having a burger, and we got some loaded fries to share. Staff were friendly, service was great. Food was excellent! My burger I had here would beat the famous Fergburger in Queenstown by a mile! Was so full from my burger, I Couldn’t order the waffles I wanted to try! 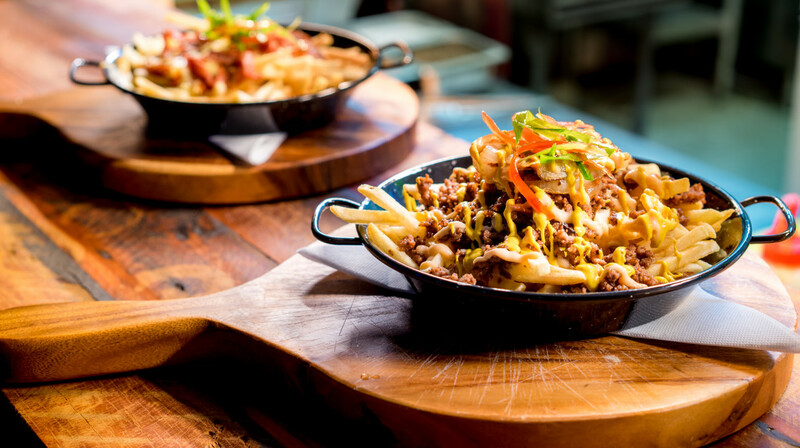 Oh and those cheeseburger loaded fries, I could just go a bowl now! Thanks for a great meal. Good food at a reasonable price, atmosphere was nice and relaxed. Would eat here again. We had a great experience at Fifty Gorillas Grill; the staff were friendly and helpful, the food came out fast, and it was delicious! Amazing time had by my girlfriend and I at Fifty Gorillas Grill. 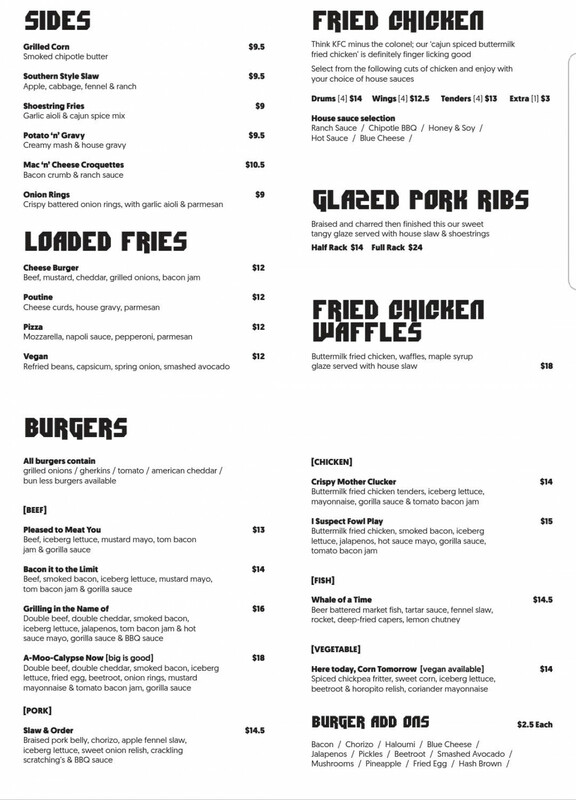 We had the fried chicken tenders with blue cheese sauce, full rack of ribs, vegetarian loaded fries and waffles for dessert. 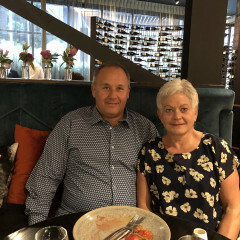 We walked away very full, the food tasted fantastic, and we were happy with the friendly service. Would recommend the tenders and sauce, and the waffles! Nice atmosphere, great value for money, fantastic service. Would definitely go back. Great Service, food is excellent. Kids and I enjoy coming here would recommend to all. My boys and I totally enjoyed our first time at 50 Gorillas. Excellent service and good tasty food. Our Waffles we huge!! so much that we couldn't eat them all. Just heaven for the sweet lovers. This was a great dining experience. The staff were very helpful and friendly. There was a good selection of food and it was delicious. There was a vegan option which was also pleasing to see. Highly recommend and will be a returning customer!! Food was great. So was the service. Will definitely be dining here again. Really positive experience. Good food. Great service. Thanks. Great burgers and friendly staff! The waffles are amazing and the service was great! Would definitely go there again. 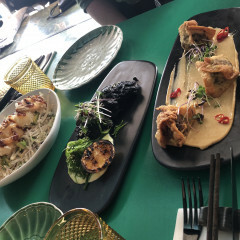 Dinner was really lovely as we were greeted warmly by the staff and the food that was served promptly was just amazing! 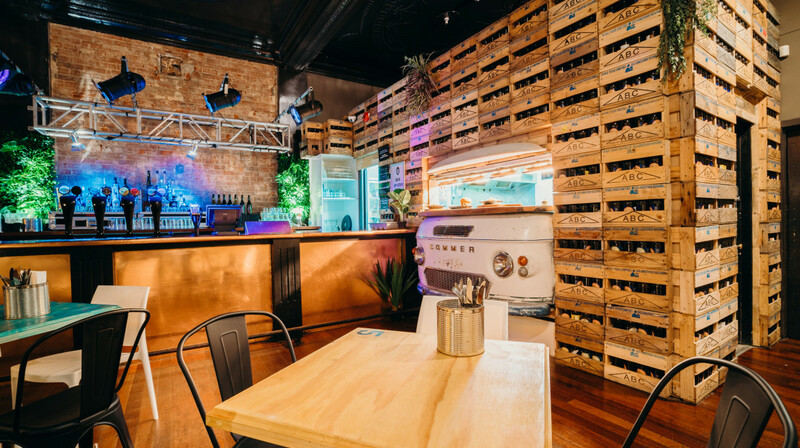 We really enjoyed the ribs and I personally feel like their ribs are one of the best in Dunedin. 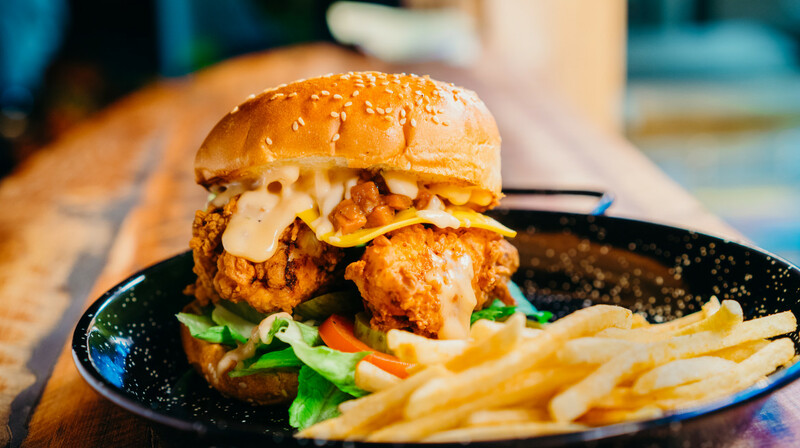 We ordered the fried chicken which lacked flavour, however the burgers we ordered were delicious and the loaded fries were good. Wow! Amazing atmosphere. Amazing staff. Amazing food. I will absolutely be back and will be recommending this place to anyone who will listen!